The Second Tallest Building In The World Is Protected From High Winds By? Which Of The Following Artists Does Not Have A Teenage Mutant Ninja Turtle Named After Them? Inside the Taipei 101, the second tallest building in the world (located in Taipei, Taiwan), you’ll find all the things you’d expect in a skyscraper of such magnitude as well as one surprising addition. Along with fantastic sky-high prime office space, restaurants, and the other trappings of modern mega-skyscraper design, you’ll also find a giant pendulum. Let us dispense with the layman’s terms though: however much like a giant pendulum the enormous 728 ton stepped-sphere shape in the heart of the building might sway back and forth in an uncanny way like a futuristic pendulum, it has a more proper name. 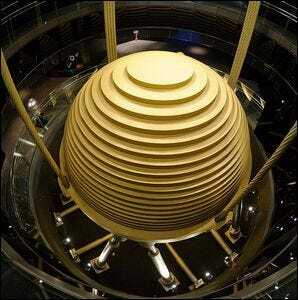 It’s a “tuned mass damper” and not just any tuned mass damper, mind you, but the largest in the world. The device is carefully designed to offset the effects of wind on the enormous building. Residents, workers, and guests in the building scarcely feel the movement of the huge structure (despite the high wind loads it experiences) because the giant ball moves to counterbalance the movement of the building. At the top of the building there is an additional pair of tuned mass dampers (much smaller at only 7 tons each) that perform the same function of stabilizing the very spire of the building.